The U.S. inaugurated The Marshall Plan (officially the European Recovery Program, ERP) to rebuild Western Europe and counter the appeal of communism. Named after Secretary of State George Marshall, the plan ran from 1948-1952 and helped rebuild the economies of Western Europe on a capitalist model. 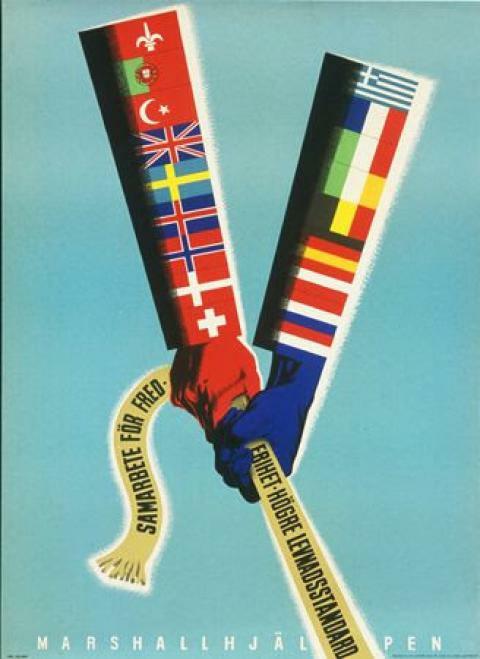 In the fall of 1950, the Intra-European Cooperation for a Better Standard of Living Poster Contest was held throughout Europe whereby artists were encouraged to submit posters that captured the spirit and goals of the Marshall Plan with an emphasis on cooperation and economic recovery as the main theme. Over 10,000 pieces were submitted from Artists from over 13 Marshall Plan countries. The entries were submitted to a jury in Paris comprised of museum curators and other artist and scholars, each representing a different Marshall Plan country. They selected twenty-five winning posters, including this one from Sweden. The flag of Greece, prominently located in the upper right, reminds us of Greece’s supporting role over sixty years ago to aid the economic recovery of Europe, and links to what is happening to Greece now. It is both ironic and criminal that Germany is the primary obstacle against forgiving or reducing Greece’s debt today, yet Greece-which was one of Germany’s creditors-supported reducing Germany’s debt after WWII. Greece was one of the countries that willingly took part in a deal to help create a stable and prosperous western Europe, despite the war crimes that German occupiers had inflicted just a few years before. When will we ever learn! Nick Dearden, The Guardian, Greece and Spain helped postwar Germany recover. Spot the difference. Harold Myerson, Washington Post, republished at Business Insider, Germany failed to learn from its own history — and now Greece is paying the price. I have held off commenting on the goings-on since my last entry because of the intrigue and utter insanity that characterizes the Greek and European political scene since the historic “NO” vote of July 5th, 2015. We have seen an apparent betrayal of the Syriza program and of the rhetoric of the government’s position. That is clear. What we can say is that — under the transparent duress imposed on Greece by the Troika of the EU, ECB, and the IMF — is that, “this is what Disaster Capitalism looks like.”. It it precisely self-determination, sovereignty, and democracy that are under attack. The interests of lenders, investors and profit are prevailing over the will of the people when it comes to those in positions of power. It is also the case that Greeks apparently do “fetishize” the Euro and desire it more than they they desire the struggles necessary to regain their sovereignty, even in the face of openly-admitted unsustainable austerity, debt, and memoranda. All political scenaria are still in play in my view, and ideological class warfare is still ongoing. It is also clear that — even Keynesians like Krugman, Stiglitz, and others say — that the economics of the Greek case are NOT the issue as much as the POLITICAL ECONOMY is. It clearly is NOT about economics. This is bigger than Greece — way bigger. Even in its apparent “betrayal”, Syriza has exposed and opened further cracks in the undemocratic foundations of the European project and those of an EU that is in clear trouble. Having said that, I still do not have high hopes for an outright success of Syriza transforming the EU into a democratic institution. Sovereignty is a secondary issue at best for them, and for too many Greeks, in my opinion. We must also recognize the geo-political forces and interests directly and indirectly in play in this scenario, involving the West’s interests in the region and vis-a-vis Russia. These might end up larger variables than meet the eye. Who — at the end end of the day — are the “extremists”? The communists? The Nazis? The anarchists? Or the capitalist oligarchs? One thing is clear: this insanity is what “Disaster Capitalism” — not democracy — looks like! So, let’s not be too quick to cast the first stone. (3) Yanis Varoufakis, from his blog, On the Euro Summit’s Statement on Greece: First thoughts. Also, the Euro-Summit “agreement” annotated by Varoufakis, also from his blog. (4) Jacob Soll, The New York Times, Germany’s Destructive Anger. Interesting. (5) Leo Panich, Socialist Project/The Bullet, The Denouement. I found this useful. But–see this post by Panich criticizing the position on Syriza of Richard Seymour of the blog Lenin’s Tomb, and this response from Seymour. (6) Christos Laskos, John Milios and Euclid Tsakalotos, via Workers’ Liberty, Communist Dilemmas on the Greek Euro-Crisis: To Exit or Not to Exit? This piece, which I haven’t read carefully enough, is from 2012, but it is interesting partly because it is co-authored by Euclid Tsakalotos, who replaced Varoufakis as the Greek finance minister.